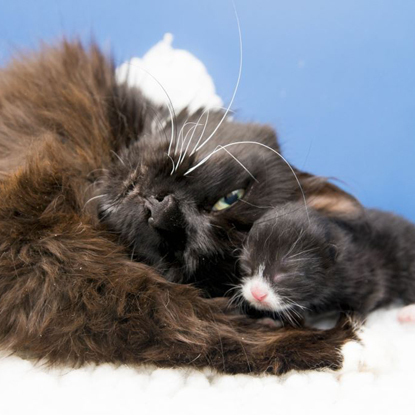 Cats Protection’s Bridgend Adoption Centre has found loving new homes for a mum and kitten who have had a very tough few months. 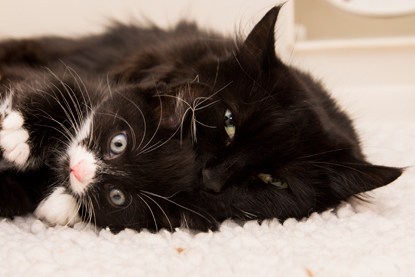 In July, a gorgeous black moggy came into the centre’s care after a member of the public found her in his shed. 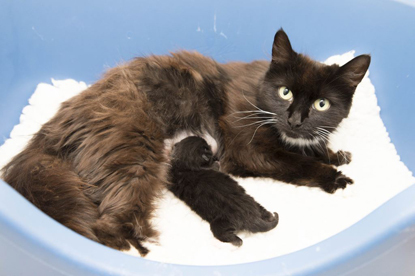 The poor cat had just given birth but sadly two of her kittens had passed away, leaving only one surviving kitten. When a check for a microchip proved unsuccessful, the Bridgend team gave the mum the name Harriet and took her to the vet for a check-up. The vet noticed that she had signs of infection and so admitted her for emergency treatment. They suspected she may have an injured pelvis and decided to x-ray her to investigate. However, the x-ray revealed something much more surprising. Harriet had a diaphragmatic hernia, a hole in the diaphragm between the chest cavity and the abdomen. As a result, her abdominal organs were in her chest cavity. While she was under general anaesthetic for the x-ray, she started to go into respiratory failure and the vet quickly contacted the centre for permission to perform potentially life-saving surgery. It was a risky operation, but Harriet beat the odds and pulled through. She then had to spend 48 hours in an oxygen tent recovering. During this tense time Harriet’s tiny kitten, who has been named Harry, was being bottle fed by the vet nurses to make sure he got all the important nutrients he needed. Thankfully, after a few days he could be reunited with his mum and she did a fantastic job of looking after him despite still recovering from her surgery. The team at Bridgend then set about searching to see if Harriet had an owner, but when no one claimed her they started an appeal to help raise funds to cover the cost of her vet care. Thanks to some very generous supporters they managed to raise an incredible £500 and Harriet made a full recovery. When Harry reached eight weeks old, both he and his mum were then ready to find their forever homes and it wasn’t long before new owners came forward. 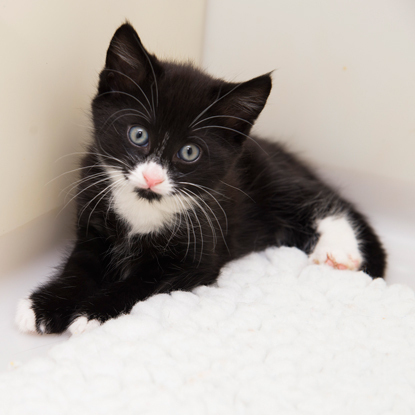 Although Harriet and Harry were very lucky to survive, having kittens is a stressful experience for cats, so Cats Protection recommends neutering them from four months old.